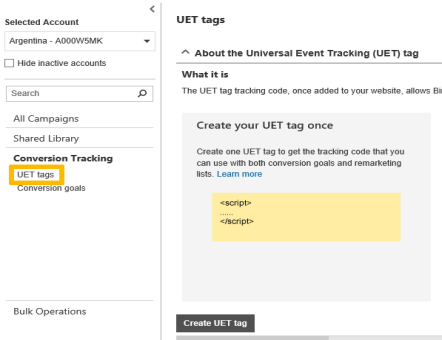 With Universal Event Tracking (UET), Bing Ads lets you track conversion goals and create remarketing lists, all with a single tag placed in your website’s code. Universal Event Tracking (UET) is a mechanism for advertisers to report user activity on their websites to Bing Ads by installing one site-wide tag. This tag records what customers do on your website, and then Bing Ads starts collecting that data allowing you to track conversions (like purchases or leads) or target audiences using remarketing lists. Before you can track conversions or target audiences using a remarketing list, you need to create a UET tag, and then add the UET tag tracking code to every page of your website. 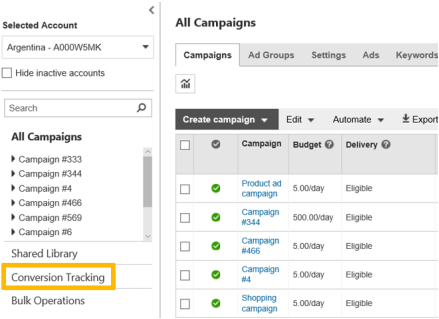 To get started, click the Campaigns page, and then on the left pane, click Conversion Tracking. Optional: Enter a description that helps you identify the UET tag in the future. We recommend that you enter the website page name or URL. 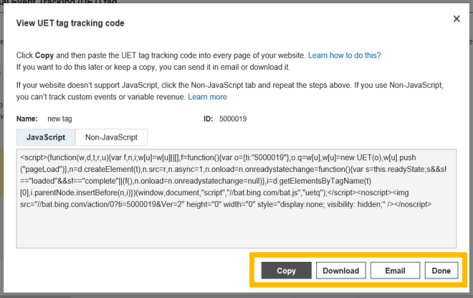 After you create a UET tag, the next step is to add the UET tag tracking code to your website. You can add it to your entire website in either the head or body sections. If your website has a master page, then that is the best place to add it because you add it once and it is included on all pages. There are two ways to add the UET tag tracking code - either directly or using a tag manager. The benefit of using a tag manager is that it allows you to manage your website tags in one place so you don't have to update your website all the time. Once the UET tag is installed by the advertiser across their website, the tag reports user activity on the advertiser website to Bing Ads. Advertisers can then create conversion goals to specify which subset of user actions on the website qualify to be counted as conversions. Note: UET will work with all industry-ready tag management systems. To learn how to add the UET tag tracking code with the different tag managers, see the UET examples website. Read more about reasons for creating more than one UET tag. When you create an online advertising campaign in Bing Ads, you want to achieve specific business goals, such as raising brand awareness, generating leads, gaining newsletter subscriptions, driving app downloads, driving online or offline sales to retaining customers, or maintaining loyalty. Conversion tracking allows you to measure the ROI (return on investment) of your advertising campaign by counting the type and number of activities people complete on your website. When the action matches your conversion goal, it is counted as a conversion. 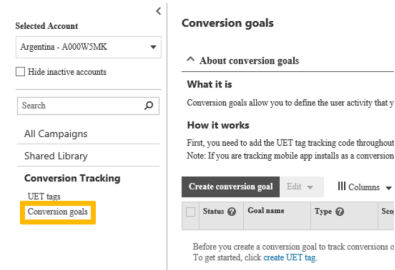 The goals page shows conversion metrics, and you can view aggregate conversion counts for each goal in the Conversion Tracking > Conversion Goals page. Furthermore, you can run the Goals reports in the UI (Reports tab) or API to segment that data by accounts, campaigns, ad groups and keywords. You can validate the setup of your conversion tracking by going to the UET tags page and making sure the tag is Tag active. On the Conversion goals page, create a conversion goal. Trigger an ad on Bing, click the ad, and then convert on the site. In three hours, revisit the Conversion Goals page to see that the goal is counting conversions. You can also use the function for a Custom Event, which verifies if the input string is present anywhere in the URL reported by the UET tag. The UET tag gathers the information that the conversion goal uses to track conversions in Bing Ads. By defining conversion goals, you can measure if and how many times people do the actions on your website. You will then be able to answer questions such as - Which ad campaigns, ad groups, ads and keywords are most effective in driving conversions? and What is the return on investment of my advertising dollars? How do I create a Conversion goal? 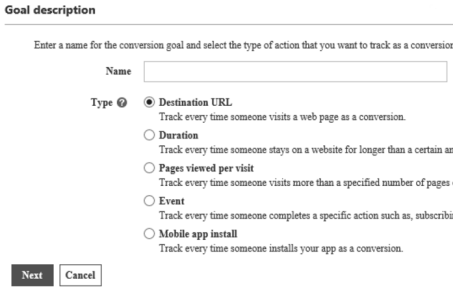 Choose the type of conversion you want to track: Destination URL, Duration, Pages viewed per visit, Custom event or Mobile app install. Fill in the appropriate values for the goal type you choose. Read more about different goal types. Once you have decided on a goal type, under Scope, select if you want this goal to apply to all accounts or a specific account. If you select all accounts, you won't be able to set the currency of the revenue value. The currency of the revenue value will be determined based on the account currency to which the conversion was attributed. Each conversion action has the same value tick box. Enter the amount and select the currency (if available). This is a static revenue value that doesn't change. The value of this conversion action may vary (for instance, by purchase price) tick box. Enter the default amount and select the default currency (if available) to be used when no value is received for a conversion. The revenue value will change based on the customisation you make to the UET tag tracking code that you add to your website. Note: To see the complete list of currencies available for conversion goals, see Conversion Goal Revenue Currencies. If your UET tag has been on your web page for more than 24 hours, you can review the UET tracking status in Bing Ads to see if the tag is active or inactive. A Tag active status means Bing Ads has seen your UET tag, but hasn't recorded any conversions in the last 7 days. This is most likely because you either have created the goal incorrectly, have not tagged your entire website, especially the pages that have the conversion action, or you don't have any users converting on your site. When set up correctly, UET tags are a powerful tool for helping you to reach your ROI goals. However, it can be tricky to set them up, which is where the UET Tag Helper comes in handy. You can install the UET Tag Helper from the Chrome web store. Simply click Add to Chrome and then Add extension. Universal Event Tracking lets you create and track conversion tracking and remarketing goals in a few easy steps. Add a UET tag tracking code directly or using a tag manager. 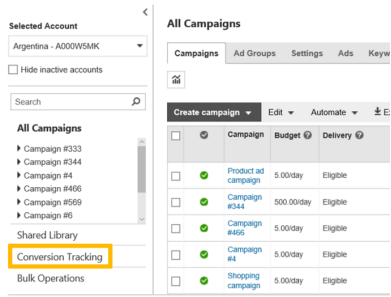 Define the actions you want to track (goals) as conversions in Bing Ads. Thanks for reading this training on Universal Event Tracking. Continue your training or take the Bing Ads Accredited Professional exam to become accredited.